Brachial plexus injuries range in severity and cause. The effects may be mild or severe. Unfortunately traumatic incidences of BP injuries are on the rise, often leading to severe social and financial hardships, and greatly affecting quality of life QOL. This page outlines the main issues arising from BP injuries and the rational behind their management. Historical note : Homer (approx. 800 BC) depicted a battle in The Illiad which involved Hector striking Teucer over the clavicle with a rock and preventing him from wielding his bow. Brachial plexus is the network of nerves which runs through the cervical spine, neck, axilla and then into arm or it is a network of nerves passing through the cervico axillary canal to reach axilla and innervates brachium (upper arm), antebrachium (forearm) and hand.It is a somatic nerve plexus formed by intercommunications among the ventral rami (roots) of the lower 4 cervical nerves (C5-C8) and the first thoracic nerve (T1). The brachial plexus is responsible for cutaneous and muscular innervation of the entire upper limb, with two exceptions: the trapezius muscle innervated by the spinal accessory nerve (CN XI) and an area of skin near the axilla innervated by the intercostobrachial nerve. The plexus consists of roots, trunks, divisions,cords and branches. 3. DIVISIONS OF THE TRUNKS: Each trunk divides into ventral and dorsal divisions (which ultimately supply the anterior and posterior aspects of the limb). These divisions join to form cords. The network of nerves is fragile and can be damaged by pressure, stretching, or cutting. Stretching can occur when the head and neck are forced away from the shoulder, such as might happen in a fall from a motorcycle. If severe enough, the nerves can actually avulse, or tear out of their roots in the neck. Pressure could occur from crushing of the brachial plexus between the collarbone and first rib, or swelling in this area from injured muscles or other structures. The former examples of events are caused by one of two mechanisms that remain constant during the injury.. The two mechanisms that can occur are traction and heavy impact. These two methods disturb the nerves of the brachial plexus and cause the injury. TRACTION: Traction, also known as stretch injury, is one of the mechanisms that cause brachial plexus injury. 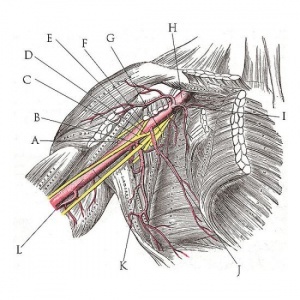 The nerves of the brachial plexus are damaged due to the forced pull by the widening of the shoulder and neck.Traction occurs from severe movement and causes a pull or tension among the nerves. There are two types of traction: downward traction and upward traction. In downward traction there is tension of the arm which forces the angle of the neck and shoulder to become broader. This tension is forced and can cause lesions of the upper roots and trunk of the nerves of the brachial plexus. Upward traction also results in the broadening of the angle between the arm and chest as occurs when the arm and shoulder are forced upward, this time the nerves of T1 and C8 are torn away. IMPACT: Heavy impact to the shoulder is the second common mechanism to causing injury to the brachial plexus. Depending on the severity of the impact, lesions can occur at all nerves in the brachial plexus. The location of impact also affects the severity of the injury and depending on the location the nerves of the brachial plexus may be ruptured or avulsed. Some forms of impact that affect the injury to the brachial plexus are shoulder dislocation, clavicle fractures, hyperextension of the arm and sometimes delivery at birth. During the delivery of a baby, the shoulder of the baby may graze against the pelvic bone of the mother. During this process, the brachial plexus can receive damage resulting in injury.This is very low compared to the other identified brachial plexus injuries. Upper plexus palsy (Erb’s palsy in the OBPI cases) involves C5-C6+/-C7roots. Some authors have included a fourth type,an intermediate type that primarily involves the C7 root. 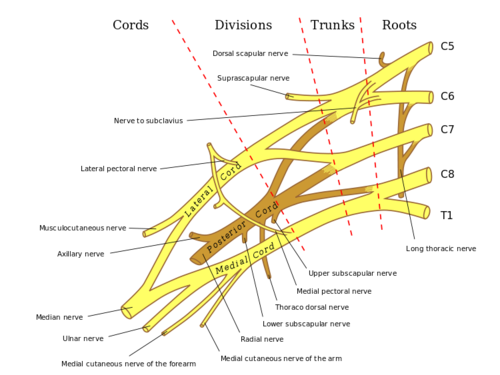 Site of injury: The region of the upper trunk of the brachial plexus is called Erb's point. Six nerves meet here. Injury to the upper trunk causes Erb's Paralysis. Nerve roots involved: Mainly C5 and partly C6. The deformity is known as "Policeman's tip hand" or "Porter's tip hand". Abduction and lateral rotation of the arm (shoulder). Flexion and supination of forearm. Biceps and supinator jerks are lost. Sensations are lost over a small area over the lower part of the deltoid. Site of injury: Lower trunk of the brachial plexus. Cause of injury: Undue abduction of the arm, as in clutching a tree branch with the hand during a fall from a height, or sometimes in birth injury. Nerve roots involved: Mainly T1 and partly C8. Ulnar flexors of the wrist and fingers (C8). Deformity: (position of the hand): claw hand due to the unopposed action of the long flexors and extensors of the fingers. In a claw hand there is hyperextension at the metacarpophalangeal joints and flexion at the interphalangeal joints. Horner's syndrome: ptosis, miosis, anhydrosis, enophthalmos and loss of ciliospinal reflex- may be associated. This is because of injury to sympathetic fibres to the head and neck that leave the spinal cord through nerve T1. Vasomotor changes: The skin areas with sensory loss is warner due to arteriolar dilation. it is also drier due to the absence of sweating as there is loss of sympathetic activity. Tropic changes: Long standing case of paralysis leads to dry and scaly skin.The nails crack easily with atrophy of the pulp of fingers. Nerve involved: musculocutaneous, lateral root of median. All muscles supplied by the median nerve, except those of hand. Five muscles of the hand supplied bye the median nerve. Vasomotor and tropic changes as a bone. Physiotherapy treatment for BP injury varies significantly according to the type and severity of the injury. 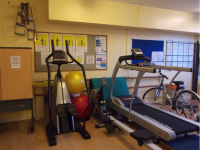 In mild cases physiotherapy and rehabilitation will assist recovery, in more severe cases surgery and bracing may be needed. Always the goal stays constant ie to return to previous level of function and preventing potential disability. Maintaining ROM via passive movements, exercise therapy, splinting and positioning and protection of denervated dermatomes. Functional training and adoption adaptive devices if needed. Managing chronic oedema via education, compression garments and massage therapy. The video clips below highlight the scope of treatment that may be undertaken due to the variance of injuries. The following video shows treatment methods that may be employed after a Vespa scooter accident. The next video is a treatment approach for an infant with a traction injury to the brachial plexus. The next video shows treatment that may occur following a simple over stretching of the brachial plexus. The next video is demonstrating BP neuromobility stretches could be used in the rehabilitation of eg sporting BP injuries. Neuromobilty places an important role in eliminating pain and restoring function. Surgery is an option for severe brachial plexus injuries, and to be viable should occur within certain timeframes. Surgery aims to regain function by surgical repair. This can take the from of nerve grafts, nerve transfers or both, and possible musculoskeletal reconstructions. Physiotherapists are crucial in the rehabilative phase post surgery in the restoring of function via strength, co-ordination, flexibility, ROM, power and use of splinting if needed. The client needs to be aware that the rehabilitation phase will be year(s) not weeks. The video clips below are examples of use of allografts and autografts. These complex procedures will need intensive physiotherapy after to resore the arm to the most optical outcome. Pain management is often a major issue. Significant pain occurs with root avulsions, causing neuropathic pain. Severe pain will also exhaust the client and if not treated appropriately will hinder the physiotherapy rehabilitation. This is when drugs should be used eg. NSAIDs and opioid drugs during the first stages (but not with neuropathic chronic pain). Neuropathic pain requires careful use of anti epileptic drugs (gabapentin and carbamazepine) or antidepressants such as amitriptyline. Still however less than a third of clients reports significant pain relief with this approach. Dorsal Root Entry Zone (DREZ) operation is an option for persistent pain. The operation aims to destroy the nerve signal transmission from the secondary central sensory centrally. Spinal Cord Stimulator (SCS) used to mask pain signals before they reach the brain, similar to TENS, but involves a small device and wires being inserted under the skin. Cervical SCS can be an effective treatment form of treatment for patients with neuropathic pain from brachial plexus avulsion. Psychological problems and a lack of cooperation by the patient may limit rehabilitation effects and increase disability. Funny Fact........What are armies for? To hang your handy's from! Phantom pain in a patient with brachial plexus avulsion injury. ↑ 3.0 3.1 B.D Chaurasia.Human Anatomy.Vol.1.Fourth Edition. ↑ Midha, Rajiv, MD. "Neurosurgery." Epidemiology of Brachial Plexus Injuries in a Multitrauma Po... :. Congress of Neurological Surgeons, June 1997. Web. 29 Jan. 2013. ↑ Narakas, A.O. "The Treatment of Brachial Plexus Injuries." Link.springer.com. International Orthopaedics, June 1985. Web. 28 Jan. 2013. ↑ Hems, TE. ; Mahmood, F. (Jun 2012). "Injuries of the terminal branches of the infraclavicular brachial plexus: patterns of injury, management and outcome.". J Bone Joint Surg Br 94 (6): 799–804. ↑ Coene, L.N.J.E.M. "Mechanisms of Brachial Plexus Lesions." ScienceDirect.com. Clinical Neurology and Neurosurgery, 25 Mar. 2003. Web. 29 Jan. 2013. ↑ Jeyaseelan, L.; Singh, VK. ; Ghosh, S.; Sinisi, M.; Fox, M. (Jan 2013). "Iatropathic brachial plexus injury: A complication of delayed fixation of clavicle fractures.". Bone Joint J 95–B (1): 106–10. ↑ Joyner, Benny, Mary Ann Soto, and Henry M. Adam. "Brachial Plexus Injury." Brachial Plexus Injury. Pediatrics in Review, 1 June 2006. Web. 29 Jan. 2013. ↑ Clifford R. Wheeless.Wheeless' Textbook of Orthopaedics.Duke's Orthopaedics. ↑ Andrew Hodges.A-Z of Plastic Surgery.Oxford University Press. ↑ Dodds SD et al.Perinatal Brachial Plexus Palsy. Curr Op Pediat 12: 40-47, 2000. ↑ Kay SPJ. Obstetrical Brachial Palsy. Br J Plastic Surg 51: 43-50, 1998.